1) Does Nefernefuruaten's prenom appear in the female form Ankhkheperure? or as Ankh-et-keperure? William J. Murnane, "Texts from the Amarna Period" (1995), pp. 205-206, translates it as "Ankhkheperure", but this book was published in 1995 so long ago. Is this correct? 2) If Meritaten is called "King's Chief Wife" (is she? ), whose king's wife is she? Nefernefuruaten? "Ankh-Cheperu-Ra Mery Nefer-Cheperu-Ra", so it is the "male" form. "Ankh(et)-Cheperu-Ra" is the "female" form. 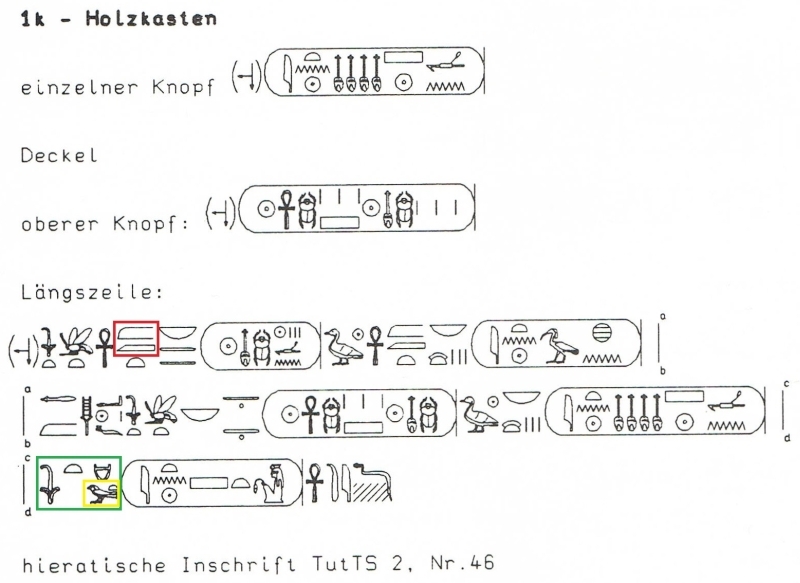 Before the cartouche of Meritaton we find the title "Hemet Nesu Weret" - "Wife of the King, the Great" (green rectangle). The yellow rectangle inside is the word "Weret" - "Great". The red rectangle before the throne name of Akhenaton ("Nefer-Cheperu-Ra Wa-En-Ra") is the short form for the word "Maa Cheru" - "Justified". This indicates that Akhenaton is called deceased. ... The red rectangle before the throne name of Akhenaton ("Nefer-Cheperu-Ra Wa-En-Ra") is the short form for the word "Maa Cheru" - "Justified". This indicates that Akhenaton is called deceased. After another reflection, and with look at the anch-sign before it, I think it would rather be the formulation "who lives of / in truth". "Maa-Cheru" one founds usually at the end of a sentence or direct behind the name. Maybe someone who really knows what he is talking about , can tell us the "truth"? The introduction before the throne name would be then as follows: "King of Upper and Lower Egypt, Who Lives from / in Truth, Lord of the Two Lands" ? 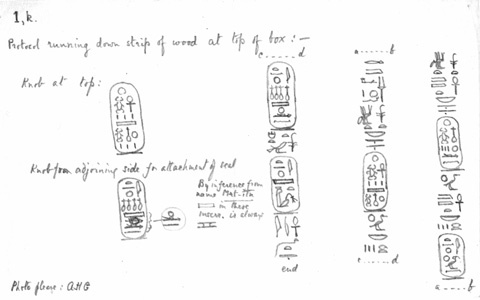 Always wondered why there is a box in KV62 naming two kings and a chief king's wife. Probably the royal family at the time the box was made.